Western Australian farmer Brett Warr added the Case IH Magnum 340 to his fleet of tractors due to its capacity to grow with his business. 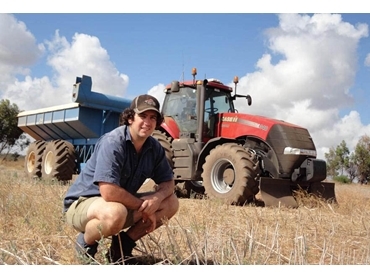 Brett and his brother, John took over the family farming business in February 2010, a move that saw a 50/50 split of the land and assets at Yuna, 70km north-east of Geraldton. The 28-year-old Brett recently took his half of the business to a new level, leasing an extra 1,200 hectares on top of the 4,800 hectares he acquired from his father. Brett explained that he chose the Case IH Magnum 340 tractor to take on smaller tasks as it didn’t make sense to use the high horsepower Case IH Steiger 535 on them. The smaller Magnum 340 tractor had the horsepower required to execute immediate tasks as well as the capacity to take on extra tasks as the business grew. Brett also owns a Case IH Axial-Flow 9120 header and a 4420 self-propelled sprayer. After evaluating available options in the market, Brett chose the all new Magnum 340 for advantages such as fuel efficiency and pulling power. The Magnum 340 has set new industry records with the preliminary Nebraska Tractor Test Lab results showing it to be 5.2% more fuel efficient than the new 2012 John Deere 8335R at maximum drawbar pull. It also tested 3.5% more fuel efficient at 75% drawbar pull maximum power, and 4.2% more fuel efficient during standard speed PTO operation. Brett says that the Magnum is primarily being used to pull a 25-tonne chaser bin and a spreader, but the powerful tractor also has the ability to tackle any number of future tasks from silage to pulling a seeding bar as he expands the size of his business.